During the Data Center Security Techtorial that I attended on Monday, I had already had a sneak preview of the software running in VMware on the presenter’s laptop. Since the CSR has not officially been released yet, this was a beta version, but as far as I could see it was fully functional. Anurag also had a couple of screenshots of the software in his presentation and he was kind enough to offer the session attendees access to the software if they wanted to evaluate it by themselves. Of course, I jumped on this opportunity. This is one of the important things that I picked up during Anurag’s presentation. Because of the 1000v in the name of the product I had always assumed that this product was part of the Nexus 1000v ecosystem, depending on the Nexus 1000v vPath redirection mechanism that is used for other virtual appliances such as the VSG and the ASA 1000v. It turns out that this is actually not the case. 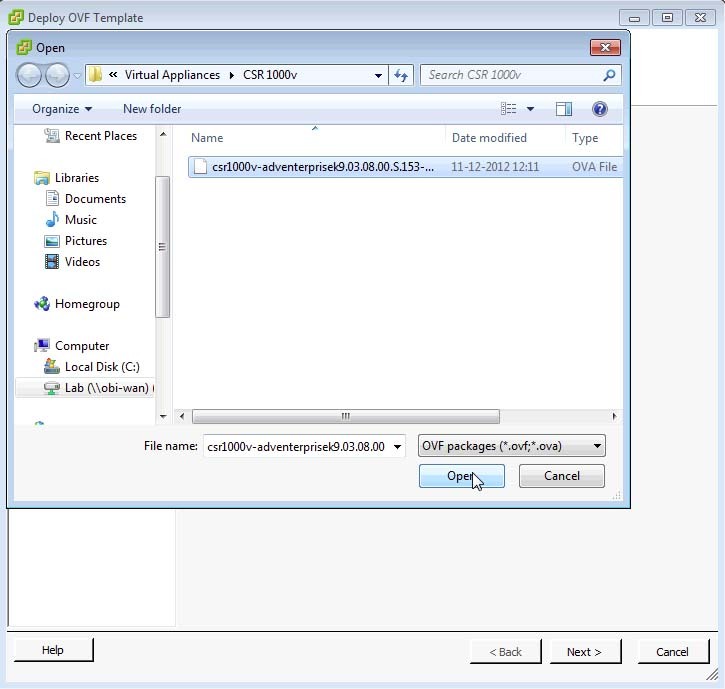 The CSR 1000v can be deployed on a standard VMware vSwitch and is simply set up as the default gateway for the VMs in the connected VLANs. Of course this means that all traffic will pass through the CSR VM, but given that this product is positioned as an entry and exit point for the virtual data center this is not a real limitation. Next I want to try to push some traffic through the router. Before you can activate the non-management interfaces on the CSR, it is necessary to activate the license and accept the Cisco EULA. 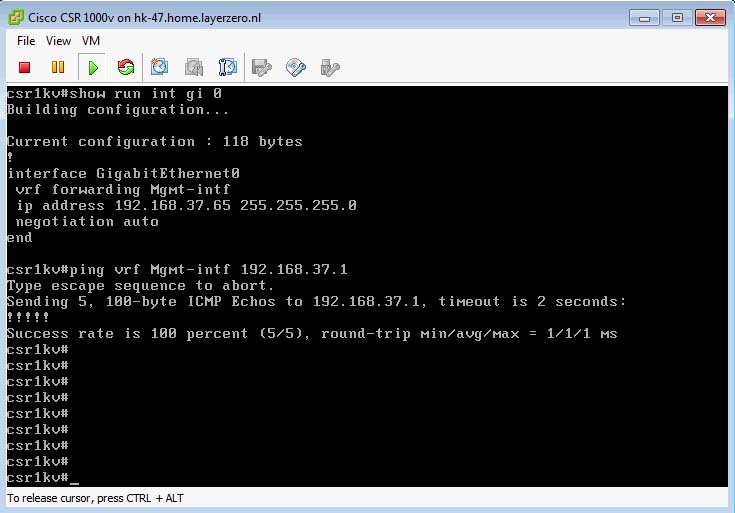 To make my life easy I connected my CSR GigabitEthernet 1 interface to a port-group that is enabled for trunking. This allows me to use sub-interfaces on the CSR to connect to any of my lab VLANs. Alternatively, I could have used two separate physical interfaces on the CSR and put them in different port-groups, one for each VLAN. 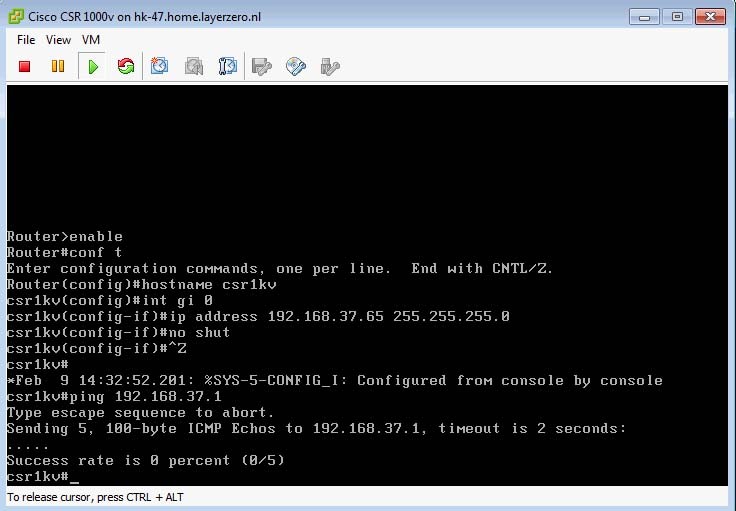 To test my connectivity I now move two of my lab VMs onto VLANs 4 and 5 and allow them to grab an IP from the DHCP pools. 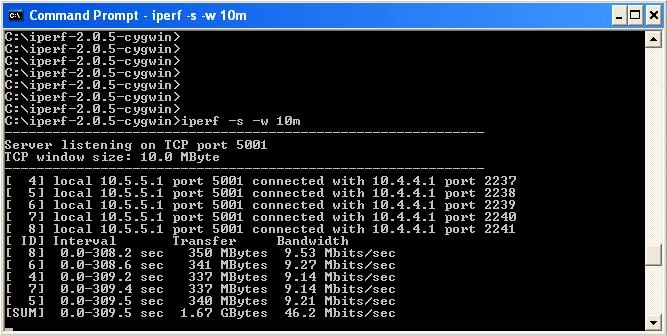 The iperf test shows a throughput of roughly 45 Mbps, which is close enough to the projected 50 Mbps for my taste, especially given the limitations of this testbed. However, the capping of throughput does raise some interesting questions: How is the licensed bandwidth actually enforced? Is this through some form of policing? And if so, do I get any visibility into this process? Is this mechanism QoS aware? Would it for example be possible to split the 50 Mbps across several different traffic classes in order to protect interactive high priority traffic from random high bandwidth sessions? All-in-all, the CSR 1000v looks very interesting. Because it is based on IOS XE it feels like a regular Cisco router, making it very easy to configure. 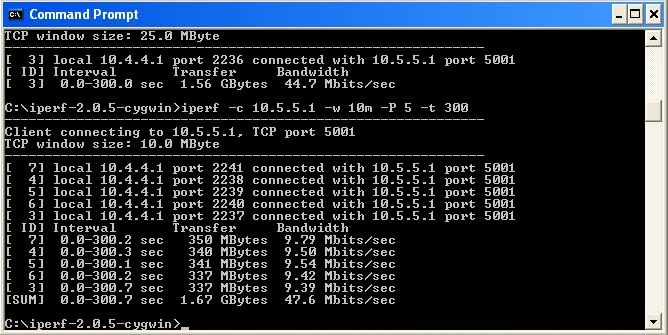 In addition, my basic tests show that it is capable of forwarding a decent traffic load, even in my very suboptimal lab setup. One of the things that I am really looking forward to is the release of an Amazon AMI version of the CSR, which will enable real hybrid cloud scenarios. Another thing that makes this product very interesting is its potential as a learning and testing tool. Could this be the official Cisco answer to Dynamips and its extended family? As a trainer and consultant I can see great potential in using the CSR to explore new protocols and technologies, test new features, or even to validate network changes. I will have to do some further testing to see how many instances I can run concurrently in my lab, but at first sight it looks like you could easily build some interesting lab scenarios using a couple of CSR instances on ESXi. So to wrap up this post: My first impressions of the CSR are quite favorable and I look forward to running it through some more complex scenarios! This entry was posted in Cloud Computing, Networking, Virtualization and tagged 1000v, cisco, ios, vmware by Tom. Bookmark the permalink. Good article. CSR1000v has great potential when you need to deploy a “data center in a box” solution. When combined with other technologies like LISP, you can stretch your data center in a short period of time. Great for testing. For your readers, I have included a link on troubleshooting “missing CPU feature requirements” messages that are sometimes encountered with deploying it in an existing ESX farm. Hope it will save someone the pain of researching how to solve it. It’s always useful to have this kind of problem documented in case somebody else runs into it. By the way, interesting site and blog you have there! Hello. You made really useful overview. And you know I was definatly sure that this product was part of the Nexus 1000v ecosystem too. So you made me more clarifying in it. 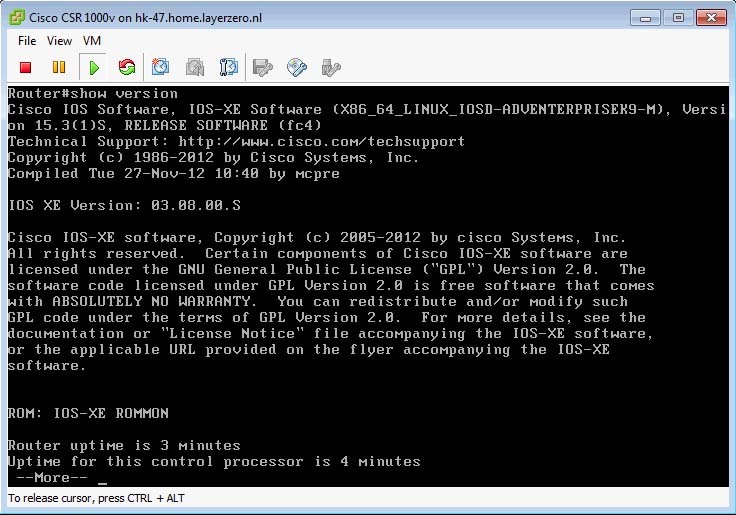 I tried to find this product via interenet,I found only this web site http://hardware.nl/cisco but unsuccesesfull.. Could tell me where can I her information about it price?